U.S. Navy personnel aboard the USS Blue Ridge push a helicopter into the sea off the coast of Vietnam in order to make room for more evacuation flights from Saigon on April 29, 1975. Twenty years after Saigon fell to the North Vietnamese, former President Bill Clinton announced the normalization of diplomatic relations with Vietnam. “This moment offers us the opportunity to bind up our own wounds," Clinton said, evoking words used by Lincoln at the end of the Civil War. "They have resisted time for too long. We can now move onto common ground." Clinton, a one-time student protester against the war, had avoided being drafted into the military, an issue that came up during his presidential campaign. Normalization had begun a year earlier in 1994, when the United States lifted a 19-year-old trade embargo against Vietnam in response to Vietnamese cooperation in accounting for the 2,238 Americans still listed as missing from the war. U.S. military personnel drape a U.S. flag over a coffin containing human remains believed to be a U.S serviceman missing in action during the Vietnam War, at a repatriation ceremony at Hanoi's Noi Bai airport on Dec. 9, 2008. Despite the move, high tariffs remained on Vietnamese exports pending the country’s qualification for “most favored nation” trade status, which Vietnam might earn after broadening its program of free-market reforms. Republican Senator John McCain of Arizona advised Clinton in making the 1995 decision. McCain was an ex-navy pilot who had spent five years as a prisoner of war in Hanoi during the Vietnam War. Brushing aside criticism of Clinton’s decision by some Republicans — most notably then majority leader Kansas Senator Bob Dole of Kansas (R), and other Republicans — McCain asserted that it was time for America to normalize relations with Vietnam. In 1996, Florida Representative Douglas “Pete” Peterson to become the first ambassador to Vietnam since Graham Martin was airlifted out of the country in late April 1975. 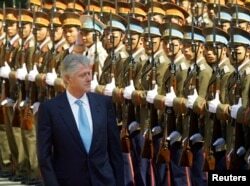 President Bill Clinton reviews a guard of honor during his official arrival ceremony in Hanoi November 17, 2000. Clinton is the first serving U.S. president to visit Vietnam since the late Richard Nixon's visit in 1969. In November 2000, Peterson greeted Clinton in Hanoi in the first presidential visit to Vietnam since Richard Nixon’s 1969 trip to South Vietnam during the Vietnam War.